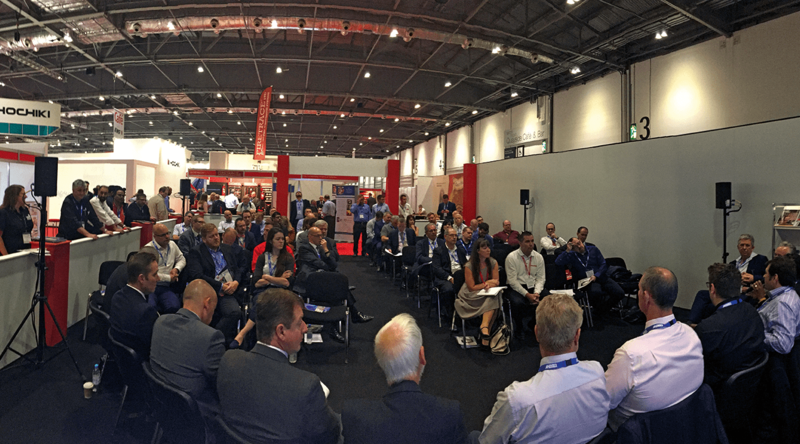 The Association for Specialist Fire Protection assembled together key experts from across the entire construction process to answer audience questions and concerns about fire protection. ASFP CEO Wilf Butcher chaired the session. 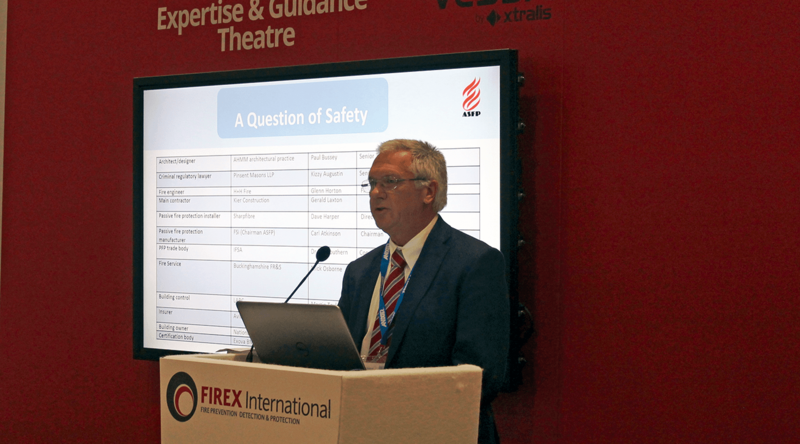 The interactive question time event, held on 22 June during Firex International, allowed visitors to pose questions to a panel of specialists; each representing a different industry discipline. Panellists ranged from an architect through to the building owner including; a criminal regulatory lawyer, a fire engineer, a Tier 1 contractor and specialist subcontractor, as well as passive fire protection manufacturers, an insurer, and representatives from building control, the fire service and a test house/certification body. There was general consensus from across the spectrum that specification was often decided on price alone, something for which the whole industry had to take some responsibility. However, it was suggested that from a legal standpoint, any decision that is made purely on price is known as an aggravating procedure for court proceedings. It was noted that if there is a safety issue that can be dealt with by using a more expensive product, then a business owner must conduct a cost benefit analysis to assess how much they are willing to spend to deal with the amount of risk to not only life safety but also building safety. ASFP CEO Wilf Butcher chaired the event. Once that cost benefit analysis has been conducted then the decision can be justified. If such an analysis is not carried out and the decision is made purely on a cost basis then that will be considered an aggravating feature so there is a culpability issue. The case was argued that specification decisions should be made by a multi-disciplinary team, which should produce a so-far-as-is-reasonably-practicable solution, taking into account all the factors, not only cost. Inconvenience was highlighted as another factor which may prevent the installation of appropriate products. If a product is seen to be difficult or time-consuming to install, it may be left out because it is inconvenient and prevents the building being closed out. Again, from a legal perspective, this would be considered an aggravating feature. It was proposed that wherever possible specifying products that can be installed quickly and easily would improve the likelihood of their installation. However, there was recognition that generally the products being installed are not complicated, but that the buildings into which systems are being installed are becoming increasingly complex. It was argued that it is the non-engagement of the fire proofing contractor during the design and the early construction process that makes fire protection difficult to fit, rather than any complexity within the fire stopping systems themselves. An example was used to highlight that inappropriate scheduling of work can be a significant problem for specialist contractors. Where a building’s fit out process has allowed for free reign in the installation of the ductwork, dampers, electrics and the air conditioning, together with everything else fitted into the building; then the specialist fire protection installer has to try to fit the relatively simple fire stopping systems around them. The Regulatory Reform Fire Safety Order was also discussed, with panellists ask to consider, some 10 years after its introduction, whether it was fit for purpose. Many expressed the view that it had resulted in improved levels of fire safety. It was noted that the number of fires in commercial buildings has decreased and the lack of a suitable and sufficient fire risk assessment was cited as the main reason for prosecutions. Meanwhile, contractors reported that building inspections undertaken as part of fire risk assessments was resulting in work being undertaken to repair legacy issues where fire protection has been breached or incorrectly installed in the past. Nevertheless, there was general concern about the competency of fire risk assessors, with fire risk assessments described as wholesalely unfit for purpose. With no minimum level of competency required for a fire risk assessor, and no established minimum qualifications, there were calls for a minimum level of competency to be mandated. The transfer of information about fire safety systems to the responsible person once a building is commissioned was also highlighted as a major issue. Despite this being a legal requirement under Regulation 38 of the Building Regulations, there was widespread belief that this information was rarely passed on to assist with fire risk assessments. The importance of ensuring records were kept and maintained about all decisions was also highlighted, with the need to prove both to courts and insurance companies how fire protection products and contractors were selected should an incident, or prosecution occur. It was noted that if there are any issues with contractor management or with risk assessment or policy documents, or the way in which products have been installed and selected then that is an offence. Also of note was that there is no legal requirement to include property protection, business continuity or the environment within a fire risk assessment. It was suggested that, with varying standards of emergency response and an increase in large loss fires due to modern methods of construction, property protection should be an integral part of ongoing fire risk assessments in the modern built environment. While the wishes of clients to get value for money for capital outlay was recognised, all believed that it should be possible in most cases to make a good business case for appropriate levels of protection. Again it was clear that to achieve this it was necessary to have all the key stakeholders around the table from the building surveyor to the fire specialist, the architect, the contractor and the building owner and insurer. The assembled panel represented the entire design and build process. However, the panel considered that anyone specifying products should understand that their liability does not end by appointing somebody that is third party approved. They must satisfy themselves that the contractor is actually doing the work they say they are doing in the way they are supposed to be doing it, by requesting test data and installation details and making sure they are installing the products that they say are essential. It was seen as vital that such schemes were supported throughout the construction phase and requested by building owners, since it is the client which drives the building specification. The issues highlighted within this question time event will be taken forward for further discussion by the panellists at a Round Table session to be held on 28 September, in support of Fire Door Safety Week. Through these ongoing discussions, the Association for Specialist Fire Protection (ASFP) aims to develop solutions to the issues identified and to offer best practice advice to all involved in the construction process.